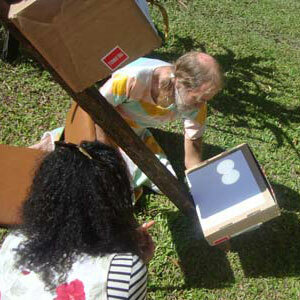 For Tonga this was really a once in a century event. 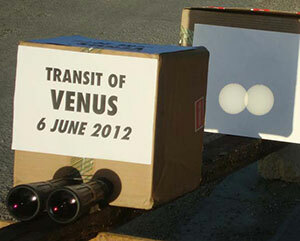 Where the 2004 transit started just after sunset and therefore was not visisble, the 2012 event ended shortly before sunset and was, on this beautifully sunny day, visible from begin to end. Tauʻolunga komipiuta had set up an observing station using binoculars, and all bypassers where invited to have the look of their lifetime. 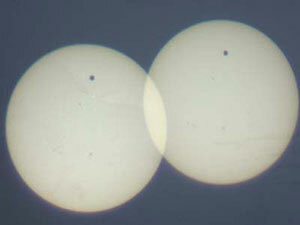 A simple binocular casted two images of the sun on the screen behind it, showing the surface of the sun with sunspots and Venus. 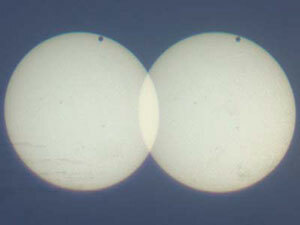 Note that Venus appeared to enter from top, progressed to about 20% onto the solardisk, and then left from top again (in reality the lowerlimb of the sun, the binoculars inverting the picture). 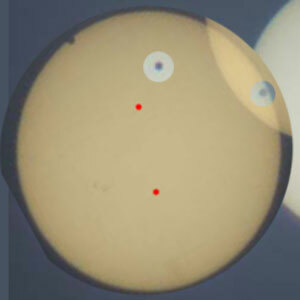 This loop was only apparent. 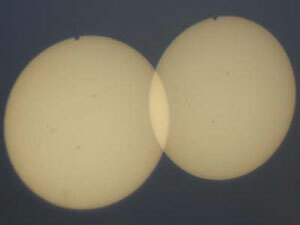 Aligning the 3 pictures on the 2 prominent sunspots shows that Venus moved in a straight line, and it was the orientation of the sun which rotated with the passing of the hours.